Cabbage Patch Jersey Knit Fitted Crib Sheet is a 100% cotton jersey knit fitted crib sheet that is the most lovely shade of deep bright green.This sheet will make your little one sleep so sound on a cloud made of soft green grass . Sheet will fit all standard crib mattresses. This sheet will also fit toddler beds with toddler mattresses. Our “Precious Little” sheet collection is now available in Jersey Knit Cotton different bright colored patterns, as well as our woven cotton sheets. Mix-n-match all these beautiful bright colors sheets into your child’s one of kind interior design look/feel. SKU: AuntBucky_CP_FittedCribSheet. Categories: Babies, Crib Bedding, Sale. Tags: Aunt Bucky, Baby Bedding, baby decor, baby gift, bumperfree crib bedding, Bumperless Crib Bedding, crib, crib decor, Crib Sheet, fitted crib sheet, gender neutral nursery, infant, infant bedding, motherhood, nursery, Nursery Decor, parenthood, pregnancy, toddler bed sheet, toddler bedding, unisex crib bedding. 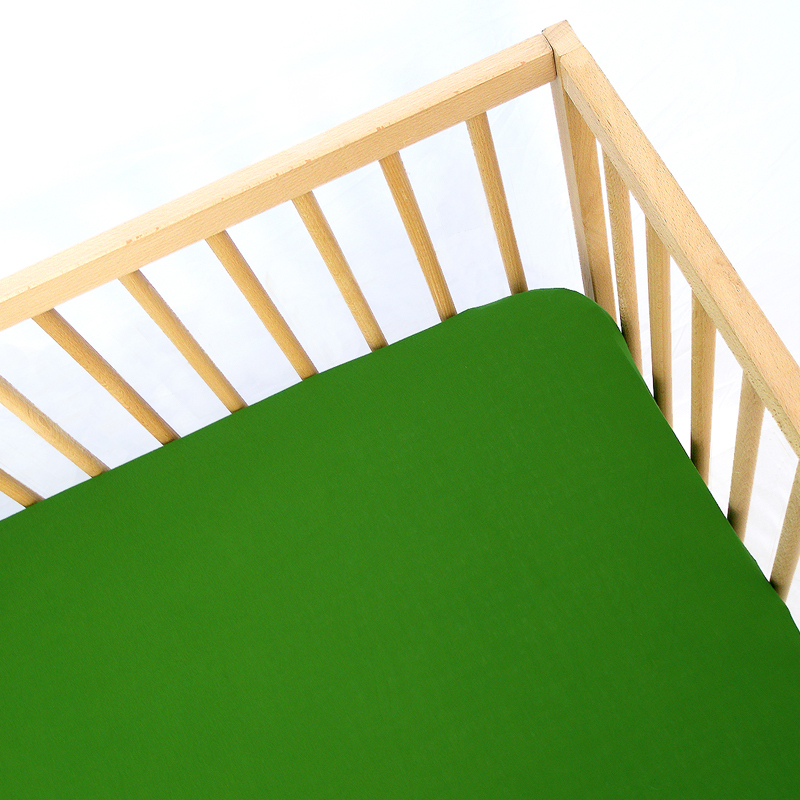 Cabbage Patch Jersey Knit Fitted Crib Sheet is a 100% cotton jersey knit fitted crib sheet that is the most lovely shade of deep bright green.This sheet will make your little one sleep so sound on a cloud made of soft green grass. The perfect unisex sheet that looks great in a garden inspired nursery or a little park ranger themed room. Sheet will fit all standard crib mattresses. This sheet will also fit toddler beds with toddler mattresses. About Aunt Bucky: Tapping into their affection for vintage fabrics, mid-century design and bold color they have created crib bedding, decor, and apparel that stimulate a baby’s development while also celebrating the fun and boundless imagination of childhood. Inspired by their grandmother who made everything from dolls to formal gowns for family members, many of which have been saved as family heirlooms, Rebecca and Whitney strive to make each piece a story that hopefully will become a family keepsake for you and yours. Playing off of the design technique common to quilting in which bits and pieces of fabric scraps collected over time are pieced together to form something new and different, all of Aunt Bucky’s designs include textiles gathered from varied sources, including fabrics no longer in production and by textile artists who they themselves limit their fabric quantities and print runs. As a result the Aunt Bucky line is ever evolving and truly unique. Our collections will always include the same style selections and design sensibility, but the individual fabric prints may vary. This process is therefore somewhat improvisational and produces near one-of-a-kind pieces.